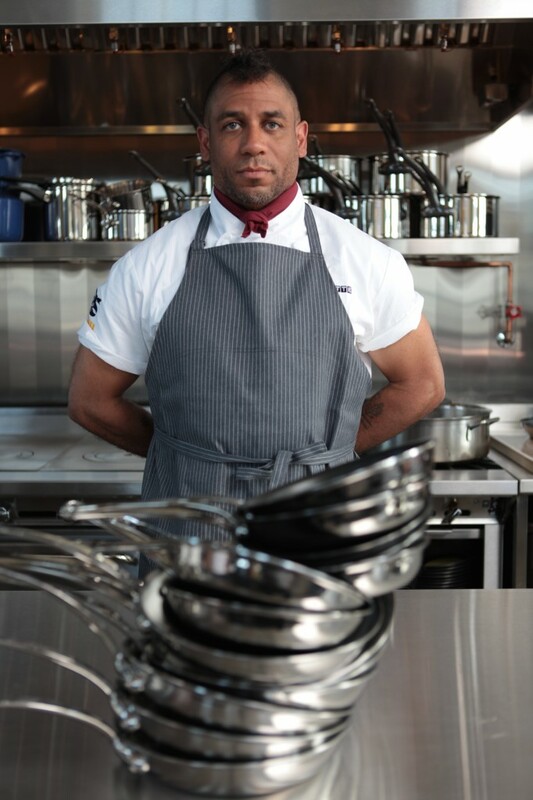 Hailing from Los Angeles, California, Chef Russell Jackson developed an early fascination for cooking by watching his mother prepare family dinners on the kitchen’s match-lit stove. Intrigued, he made an early attempt at applesauce at age three and, in the process, launched a career experimenting in the kitchen. San Francisco’s anti-authoritarian culture helped inspire his boldest move: SubCulture Dining (SCD), an underground dining club where the menu focused on sensible ingredients, and Northern California inspiration. SCD combined a darkly exciting atmosphere, a democratic application process, and a clientele ranging from worldly foodies to the young and inexperienced. Chef Jackson has twice entered the world of television. In 2013 he appeared on Iron Chef America where he battled Chef Jose Garces in a Rhubarb War. That same year Chef Jackson was a contestant on the hit reality show The Next Food Network Star where he became a fan favorite and finished third overall. Today, four restaurants launches later, and returning from the Food Network Kitchens, Chef Jackson remains active in the New York and San Francisco food scenes. SubCulture Dining is now a bi-coastal affair with a robust schedule and an ambitious agenda. He is currently working on new development projects in New York and San Francisco, and assists as a Board Member at WHEDco.org. Join him for his next culinary r(e)volution..
Burger that haunts your dreams at night: Foie Gras Stuffed Deep Fried Butter Burger. What is the one Burger you’ve always wanted to try but still have not: Dyers 100 year grease burger. The secret to making a great Burger: Stick to the basics. Best quality meat, proper fat ratio and grind, don’t over pack, season with sea salt. Under no circumstances whatsoever, what should NEVER be put on a Burger: Lays Cappuccino Chips. If you could eat any Mythical Creature which would it be: How could you not want to nosh on a Unicorn. What’s not to love.. meaty, and magical. Bonus. If you could have a Burger with anyone alive, or dead, fictional or real, who would it be and where would you take them: Marco Pierre White, Au Cheval in Chicago. Name one Burger in LA that for once, people should get off a plane and go eat instead of In-N-Out: Bob’s BigBoy!!! Please use this space to talk about or plug anything else you want: You can find me online at RussellJackson.com, watch my webshow at Popfoods.TV or eat my cooking at SubCultureDining.com. This entry was posted in Burgers, Hamburgers, The Cattle Call and tagged bar, best burger, bobs big boy, burger blog, burger club, burger conquest, cheese, Chef Russell Jackson, ciancio, david, french fries, gourmet burger, great burger, hamburger, interview, nyc, Popfoods.tv, restaurant, rev, review, SubCulture Dining, the cattle call, The Food Network, WHEDco. Bookmark the permalink.